1) Is that something you'd like to see? Yes, I would like to see videos of the actual making of different styles of cards and all the different techniques that can be used besides straight stamping with ink. I just love all the cards and layouts you make! But would absolutely love to see you post videos of how you make the cards. I'm more of a visual learner and find it a whole lot easier to make the card myself if it is shown to me. Look forward to reading everyone else's thoughts. I have been subscribed for some time and I always enjoy seeing the cards made to go with the current card sketch! Yes, I would be interested in videos demonstrating different techniques to use on my cards. Thanks! First let me say I love this blog!!! Even tho these are "basic" cards and really fast to put together I love doing them and as a new card maker it has given me the courage to branch out a little more and try other things. I think vids would be cool. Some of us haven't seen all of those other techniques you are talking about.....lol. i LOVE seeing videos of a card being put together and different techniques! Wow this is fantastic Natasha! My only question with cards like this is placement? What's your secret for stamping an image? Natasha! This is just GORGEOUS! I love your cards and I would love to watch how you make them. I watch card making videos instead of TV. I have learned so much. I would like to see more that show different folds but any card you make would be great. Great card...I believe I can always learn something new! I'd love to see videos which show techniques as well as clips about inspiration: how you get the ideas, whether it comes from a piece of paper, or anything else. It's like getting into someone's mind - and I find it fascinating! Thanks! I really love your "simple" cards. Some I see are too "busy" looking. I would love for you to make some videos to explain your techniques. Love your blog and thanks for sharing with us! Since I am very much a visual learner I love Video's. Your cards are lovely and cute and I would love to see how you do them. I always like videos. You never know what little tidbit, technique or unique use of a tool that will really help others! Another vote for videos! I'd love to see the process, from color selection to card execution. I am in the minority in that I probably wouldn't watch videos. My time is limited and I can usually get the just of a technique just seeing it in print. I really enjoy your clean & simple sketches and hope you continue posting those. I really like to do cards based on sketches. I'd love to see you make videos. I'd like to see videos on using the Nestabilities, watercolor, matching colors on a card (I struggle with coming up with an original card), using inspiration to come up with a color scheme for a card, a then there are technical type things that I know nothing about....adding dimensional to a card, adding balance to a card. This should keep you busy for a while. I would love to see videos here. I would love to see you make a card - they are always so pretty, I bet the process would be wonderful to watch! And handy tips - how you make embellishments! This is really fun. I like the colors of the stars against the kraft background and the different dimensions. I'm an advanced stamper and cardmaker, so when I see the cards made here, I pretty much understand the concepts and techniques behind them. But that's not to say that I wouldn't watch a video if it was posted. It's always interesting to see others work. I would like to see a Mr Linky with your Ten Minute Monday cards, like there is with the FTL sketches. I enjoy seeing what others do with the sketches and it's so much easier to check out their work when there is a direct link. Thanks for this great blog. I refer to it all the time when I need great ideas for CAS projects. I follow your blog because you keep things simple. I may like to see an occasional video, but I really hate getting to a blog post and seeing a really cool project and then seeing that they have a 15 minute video posted. I would rather look at a few good photos of the process. I love this---the colors you've used are awesome! Great masculine card. Videos would be fun, although I zip through my posts so quickly I am not sure how many I would watch....but if it was something unique, I would be on it. Plus, I love to hear people's voices--heeehee! I'd love to see videos is always so interesting to see the process of creating a card and you can see more details than in the photos so I think is a terrific idea. Oooh I would love to see videos!! 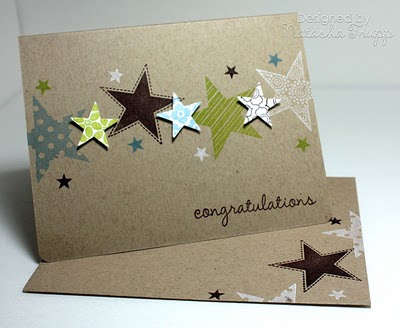 I am a beginner stamper and I am still learning about everything, I know there are a lot like me out there who would like to know the secrets of CAS cards design!!! Love the work on this blog...always fresh and so clean. Have you considered making an occasional video of a card that is being posted but any technique could be shown as they would be good reminders to try something new or repeat a technique that we have not done in awhile. Love the card. I am interested in videos that cover, making envelopes, picking colors and PP to create balance, always love stamping techniques. There may be tons of videos out there, but I haven't seen them, and they aren't by YOU. What I'd like to see most is a visual representation of your thought process when you consider a layout. Do you place the un-inked stamp and other elements on the card before actually creating? Do you try different typefaces? I'd definitely watch your videos. Videos would be awesome! I really like Kristen Werner's videos where she just makes cards. She has MACM and Finally Friday videos. What a great card! I like stars and I like kraft so I will most certainly have to CASE this card. Oh and videos are always appreciated! Yes..Videos are always better...seeing is believing..I love seeing how cards are made.. I haven't read all the comments, but I might be in the minority. No to videos. I'm afraid the "simple" focus might be lost. Most of the cards really are self-explanatory. The comments that I read in favor of videos were from beginning stampers. I would encourage a new stamper to take a class at their local stamp or craft store, subscribe to a magazine, sign up for a stamping workshop (I can't go anywhere without running into a Stampin Up demonstrator). Build up a network of stamping buddies to stamp with and learn together. Perhaps videos of basic techniques would be helpful, but a video of each card, in my opinion, would be unnecessary. Yes.......I love to watch stamping videos! Do a "Make A Card Friday"........like on this card you did....it's awesome!! I enjoy watching a card being created on video.....or how you organize your stamp supplies and paper and paper scraps.......the ideas are endless!